The days are easily identified on the box as well as the different sections of the day. Lightweight, yet very durable plastic. Prevents accidental under-dose/overdose of medication. Perfect for use while business travelling or holidaying. 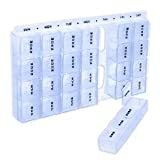 The seven day pill box is made from lightweight plastic and contains one removable, four compartment section for each day of the week.